Only available for February and March! A spacious 2 bedroom / 2 bath 1st floor coach home with 1 car attached garage. This condo is located in one of the newer construction buildings in the subdivision and features granite countertops, wood cabinets, and a great floor plan. Champions Green is adjacent to the optional-membership Gateway Country Club and Tom Fazio-designed golf course and behind the 24-hour attended security gate. Gateway features it's own common areas for all residents to enjoy - miles of scenic biking & walking paths, an Olympic-sized pool and kiddie pool, outdoor volleyball, basketball, soccer fields, parks, a dog park, and playgrounds. 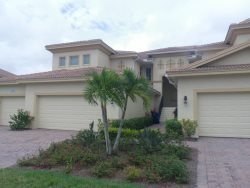 This home is situated inside the gates of Gateway Golf & Country Club. The subdivision pool is steps from the front door, The development is only minutes away from Southwest Florida International Airport, JetBlue Park, the Bell Tower Shops, and Gulf Coast Town Center. Games & Clubs, Fitness Activities.